The English word potato comes from the Spanish "patata". The potato is a starchy, tuberous crop with about 5,000 varieties worldwide and belongs to the nightshade family. The potato was first domesticated in the region of modern-day southern Peru and extreme northwestern Bolivia between 8000 and 5000 BC. The modern potatoes grown in North America arrived through European settlement and not from South America. The potato is a staple food worldwide. The potato is best known for its carbohydrate content (approximately 26 grams in a medium potato). It has a small portion of resistant starch that provides fiber and offers protection against colon cancer, improves glucose tolerance and insulin sensitivity and lowers cholesterol and triglycerides. 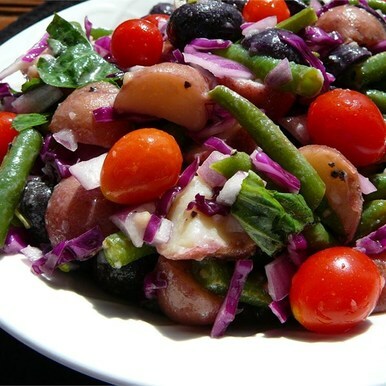 Potatoes are a good source of Vitamin C, Vitamin B6, Potassium, Manganese and dietary fiber. Potatoes should not be stored in the refrigerator, as their starch content will turn to sugar giving them an undesirable taste. They should not be stored near onions, as the gases that they each emit will cause the degradation of one another. They should be kept in a burlap or paper bag and can be kept up to two months. Put sliced potatoes and salt in a large kettle with about 1 inch of water. Bring to boil then reduce to medium heat. Cook for about 5-6 minutes. In a food processor or blender, combine the olive oil, parsley, green onions, lemon juice, Dijon mustard, garlic and freshly ground black pepper. Process until the herbs and garlic have been chopped into little pieces, then drizzle in the reserved cooking water and blend just until emulsified. If you don’t have a food processor or blender, just finely chop parsley and onions and whisk the dressing together. 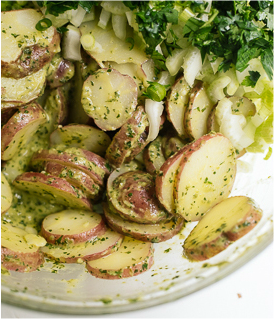 Drizzle the potatoes with the herbed olive oil mixture and mix will. It looks like it is too much but the potatoes will soak it up! Let the potatoes rest for 10 minutes, tossing every few minutes. Add the celery to the bowl, along with a couple tablespoons each of chopped parsley and green onions. Season to taste with salt and pepper and serve. This will keep well in the refrigerator for about two days. Peel the potatoes and place them in a large pot with enough water to cover them. Bring to a boil, and let them cook in the boiling water for 10 minutes or so The potatoes should be cooked through but still firm. Drain the potatoes and let them cool briefly. Cut the potatoes in smaller bite-size pieces. 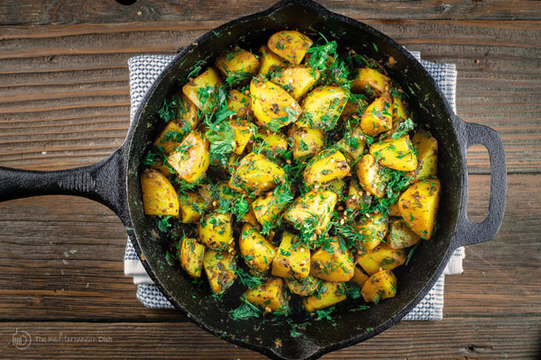 Heat the olive oil in a cast-iron skillet or fry pan, on medium heat. Stir in the garlic, red pepper flakes and coriander seeds. Cook for 2-3 minutes then add the turmeric and lime juice. Toss in the potatoes, mix well to coat. Add ½ of the fresh cilantro parsley and fresh dill. Cook for 4 more minutes. Add salt and pepper to taste. Remove from heat and top with more red pepper flakes and the remaining fresh herbs. 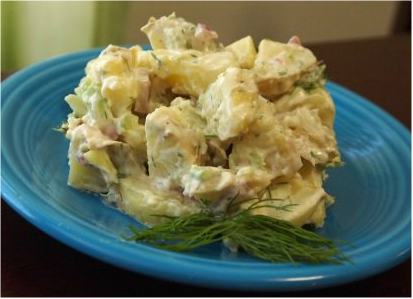 You can serve this potato salad warm or cold. Cook potatoes in a pot covered with water. Bring to boil and cook for 10 minutes or so. The potatoes should be cooked through but still firm. While potatoes are cooking, bring 1 quart water to boil in a medium saucepan. Add asparagus to boiling water and allow to cool just a couple of minutes. Remove from heat, drain and plunge into cold water to stop the cooking process. In a small bowl, whisk together olive oil, lemon juice, basil, vinegar, garlic, sugar, salt and pepper. Set aside. 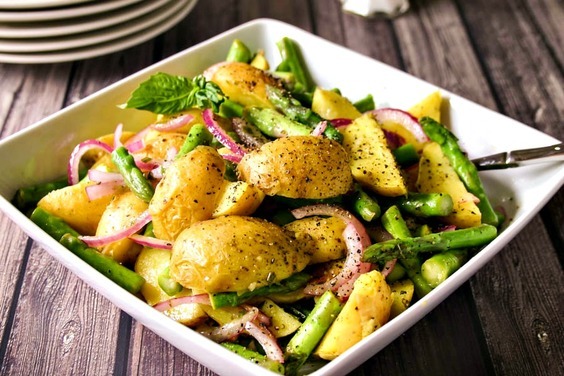 Thinly slice red onion, quarter the potatoes, and slice asparagus into bite-sized pieces Add veggies t o large bowl and toss gently with vinaigrette. May serve warm or chill for 30 minutes before serving. In a large pot, cook whole potatoes in water until done. Cool. Cut into bite-sized pieces. In a very large bowl, combine all ingredients from potatoes through basil. Whisk together dressing ingredients. Toss with vegetables, and add salt and pepper to tasted. The dressing can be thinned with small amounts of juice from the Claussen dill pickles until you get the consistency you want. Put potatoes in a big pot with enough water to cover about 1”. Season with salt and bring the water to boil. Cook just until the potatoes are tender when pierced with a fork, about 25 minutes. Drain and set aside to cool. Dice the celery, onion, pickles, tofu and place in a large bowl. Mix in with the potatoes when they are cool. Mix the dressing ingredients in a bowl until smooth and add to the potato mixture. I sometimes add other vegetables such as cucumbers, radishes, jalapeno peppers, green or red peppers. This is a very versatile recipe and a favorite of our children.